Exercise is one of the toughest things to take on when you have chronic fatigue syndrome (ME/CFS). A primary symptom is post-exertional malaise, which is an abnormal and extreme reaction to small amounts of exercise. Symptoms can be severe and include a massive increase in fatigue, pain, cognitive dysfunction, flu-like symptoms and more. For some people, it takes an incredibly small amount of exertion to trigger post-exertional malaise. The sickest people may not be able to sit up in bed for very long. Some people may be able to walk a few blocks. However, others may be able to tolerate significantly more activity. It's important for each person with this disease to understand and stick to their limits. The benefits of yoga, in general, include loosening up muscles, joints, and connective tissues, and improving strength and balance. But is it right for ME/CFS, with post-exertional malaise plus other problematic symptoms such as dizziness and muscle pain? We don't have a lot of research on yoga for ME/CFS, but what we do have suggests that it just might be – at least in some cases, and when done a certain way. Keep in mind that research is extremely limited and that no treatment is right for everyone. Always check with your doctor to make sure any exercise regimen you attempt is safe for you. It's also essential for you to pay attention to the signals your body gives you and tailor your activity level appropriately. While we have very little research, the good news is that it appears to be a positive start. In a typical yoga session, people do poses in multiple positions: sitting, standing, lying down. Some poses push the limits of balance and strength. Some forms of yoga include a lot of movement and provide a cardio vascular workout. Cognitive dysfunction can make it difficult to remember a routine or the proper way to do a pose. All this means that a yoga regimen for people with this disease would have to specifically tailored to the condition. Because every case of ME/CFS is unique, with symptoms and severities that vary widely, it would need to be further tailored to the individual. In the study below, researchers took all of this into account. In a study published in 2014 (Oka), Japanese researchers set out to see whether yoga would help people with ME/CFS that was resistant to conventional treatments. First, they had to design a yoga routine that would work for someone with the condition. After consulting with yoga experts, they settled on isometric yoga, which is done in a stationary position and primarily involves flexing of the muscles while maintaining a position. They say a benefit of isometric yoga was that participants could flex more or less depending on their individual abilities. Researchers also wanted the regimen it to help counter deconditioning while keeping it simple and easy to follow. The yoga program they designed included six poses which were all done while sitting in a chair. Patients met one-on-one with an experienced instructor. Music, which is commonly used in yoga sessions, was not allowed due to the possibility of noise sensitivity. The 20-minute program was modified on an individual basis, such as by skipping a pose that caused pain or doing fewer repetitions due to more severe fatigue. Exercise studies of sick populations can be problematic, especially when exercise intolerance is a major part of the disease in question. That meant that study participants had to be carefully selected. Subjects were chosen based on the Fukuda diagnostic criteria, then further narrowed down to those who hadn't responded well to conventional treatments. To ensure that they were able to take part in the study, they had to be able to sit for at least 30 minutes, visit the medical facility every few weeks, and fill out the questionnaire without assistance. Also, they had to be fatigued enough to miss school or work several days a month but not enough to need help with basic activities of daily life. That means these results may not apply to more severe cases. This was a small study, involving 30 subjects with ME/CFS, 15 of whom did yoga and 15 of whom were given conventional treatments. After the first session, two people said they felt tired. One reported being dizzy. However, these things were not reported after subsequent sessions and none of the participants withdrew. Researchers say yoga appeared to significantly reduce fatigue. Also, many participants reported feeling warmer and lighter after yoga sessions. In the end, what we know is that this particular approach to yoga helps people with ME/CFS who are not among the most severely ill. That might not seem like a lot, but it's a start. We can hope that more researchers use this yoga protocol or something similar to replicate the study. If this is a regimen that can improve symptoms without triggering post-exertional malaise, it could be extremely valuable. In 2015, the two-year follow-up to a case study (Yadav) was published that had promising information about yoga and related practices for ME/CFS. He attended six sessions. Two years later, these lifestyle changes appeared to have made considerable improvement in his personality, well-being, anxiety, and illness profile. So what does this tell us? It worked for one man, but that doesn't mean it would work for everyone. Also, we don't know how much yoga, or any other single element, contributed to his overall improvement. Still, it's often cases like this that lead to further research. And that sums up the research to date. Other Yoga Research: What Does it Mean for ME/CFS? Research on yoga for other conditions shows that it may lessen fatigue, but we don't know if that applies to the unique fatigue states of ME/CFS. We have more research on yoga for fibromyalgia, which is extremely similar to ME/CFS. For example, one study (Carson) suggests that yoga may increase the stress-hormone cortisol in people with fibromyalgia. Both fibromyalgia and ME/CFS often feature abnormal cortisol function. Another study (Mithra) showed improvement of physical and psychological symptoms in fibromyalgia as well as several other neurological conditions, including multiple sclerosis, Alzheimer's disease, epilepsy, and stroke. ME/CFS is believed to be, at least in part, neurological. However, it's impossible to know if the results would be the same for ME/CFS. We don't yet know enough about the common physiology between fibromyalgia and ME/CFS and the specific symptoms it causes to say that what's good for one is good for the other. Beyond that, we have to rely on anecdotal evidence, which is always a mixed bag when it comes to physical activity and ME/CFS. Some (but not all) doctors recommend yoga and some (but not all) people report success with it. In the end, it's up to you (with guidance from your health-care team) to determine whether yoga is something you should try. You've got a lot of options when it comes to doing yoga. You can take a class or find a personal instructor, but that's not a good option for many — the exertion of getting there may be too much. However, you can also buy a video or find free ones online, or design your own routine. If you're new to yoga, it may be a better idea to have a class or video so you can benefit from the instructor's knowledge. No matter where you're doing it, it's best to proceed very slowly. You may want to start with just a single pose or two a day. Take your cues from the Japanese research discussed above and see if those poses work for you. Then, if you're confident that it's not making you feel worse, you can start increasing your yoga time. Rather than making sessions longer, you might try adding a second session to your day. By working in short bursts with long periods of rest in between, you may find you're able to do more without triggering post-exertional malaise. Boehm K, et al. Evidence-based complementary and alternative medicine: eCAM. 2012;2012:124703. Effects of yoga interventions on fatigue: a meta-analysis. Curtis K, Osadchuk A, Katz J. Journal of Pain Research. 2011 July;2011(4):189-201. 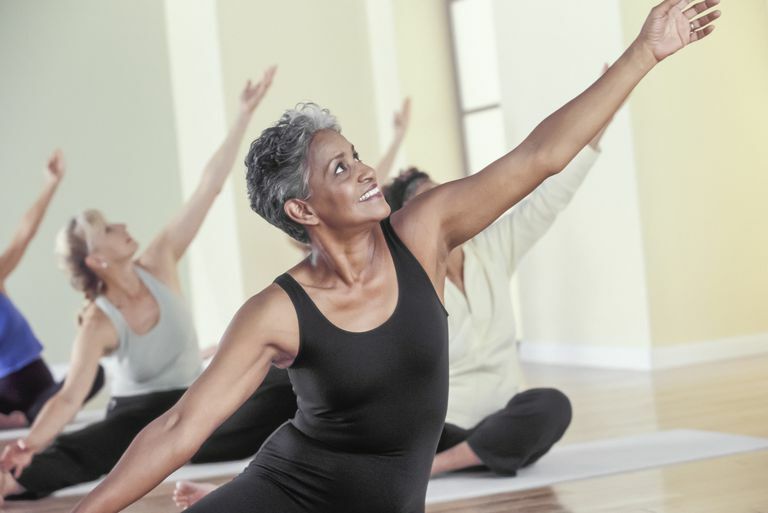 An eight-week yoga intervention is associated with improvements in pain, psychological functioning and mindfulness, and changes in cortisol levels in women with fibromyalgia. D'Silva S, et al. Psychosomatics. 2012 Sep-Oct;53(5):407-23. Mind-body medicine therapies for a range of depression severity: a systematic review. Mishra SK, et al. Annals of Indian Academy of Neurology. 2012 Oct;15(4):247-54. The therapeutic value of yoga in neurological disorders. Oka T, et al. Biophsychosocial medicine. 2014 Dec 11;8(1):27. Isometric yoga improves the fatigue and pain of patients with chronic fatigue syndrome who are resistant to conventional therapy: a randomized, controlled trial. Yadav RK, et al. Journal of alternative and complementary medicine. 2015 Apr;21(4):246-9. A two-year follow-up case of chronic fatigue syndrome: substantial improvement in personality following a yoga-based lifestyle intervention.